A great teacher can spark a love of STEM in future generations of students, which is why we at the STEM Education Center are committed to empowering them with the guidance to lead relevant, integrated, and inclusive STEM learning experiences with their students and communities. Through our work, we’re dedicated to the strengthening of STEM learning ecosystems through partnerships among teachers, administrators, community members, and funders—all with the common goal of advancing and transforming STEM education. We offer undergraduate STEM teacher preparation for licensure at the middle- and high school levels, professional development for current PreK-12 educators, research to advance STEM education, and community engagement to foster equity and access for all learners. Do you care about K-12 education and science, technology, engineering, and math (STEM)? Want to make a difference in Worcester? 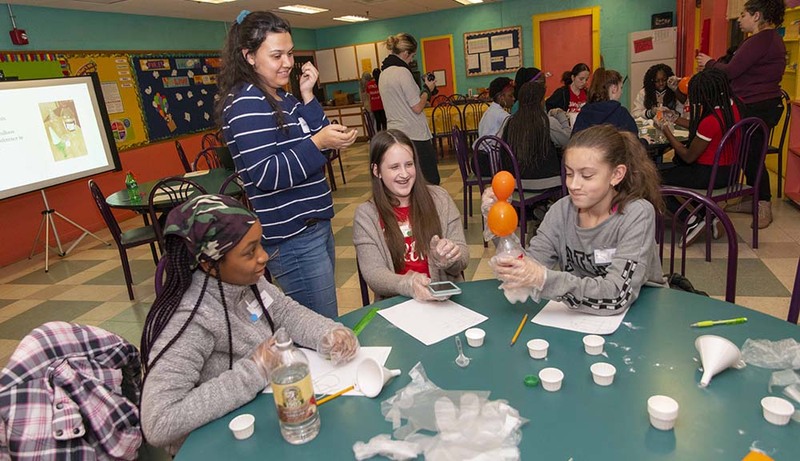 The STEM Education Center and Pre-collegiate Outreach Programs offices at WPI are hiring an AmeriCorps VISTA to to help build the infrastructure and capacity at Worcester Polytechnic Institute (WPI) to sustainably and effectively support PreK-12 students, educators, and families in the greater Worcester County region with equitable access to high-quality, integrated, and inclusive STEM education opportunities. The position is a year-long opportunity starting in July 2019. Learn more about the opportunity by reading the job description and apply now. Applications are due no later than May 1st (or until the position is full). Learn more about the AmeriCorps VISTAs at WPI in 2018-2019. Students in the WPI Teacher Preparation Program lead their lesson plans as part of their Pre-Practicums at Girls, Inc.
PreK-12 teachers collaborate on their engineering design solution during a professional development session. The STEM Education Center and community partners chat with a “Designing My Future” attendee about different pathways in STEM. Teacher participants at the Project Lead the Way Conference held at WPI in October. Professional Development Director Mia Dubosarsky (left) shares a PreK engineering curriculum developed together with Head Start. Students do activities and learn about STEM careers at a Family Expo event by the STEM Education Center and community members. Preschool children identify the steps of the engineering design process as part of the Seeds of STEM curriculum and grant. 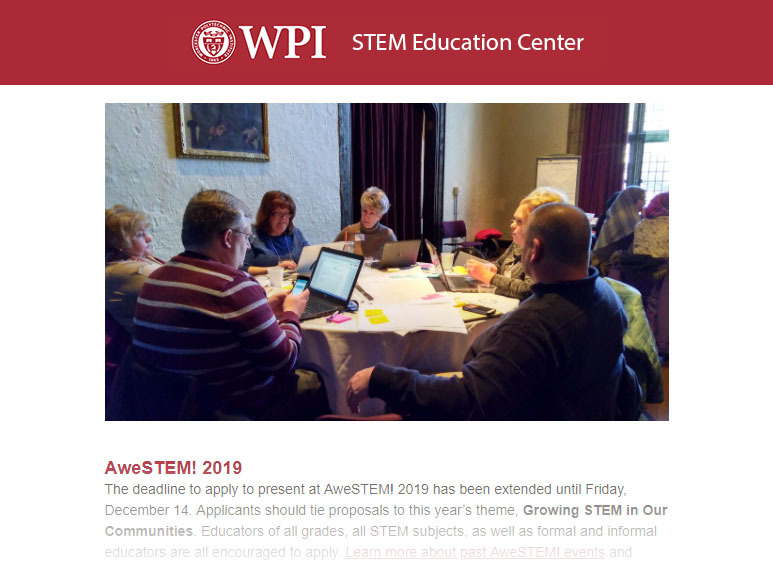 Join the STEM Education Center mailing list to receive monthly newsletters covering news, events, and other opportunities at WPI for educators and those who support them.